You would agree that Grace is no stranger to adversity. HIV positive, Grace is on her own to not only stay healthy, but also to care for her three children in a small village outside of Choma, Zambia. Grace is on her own because she reached her breaking point.Her husband’s ongoing promiscuity for years and years left her and her son HIV positive, and she wouldn’t tolerate it any longer. She left him early last year. Liberated? Yes. Scared to not have his financial support any longer? Absolutely. I drove about two hours off the main road to get to her small village,and though the landscape is beautiful and neighbors are friendly, it didn’t look like the area offered much opportunity. It would be easy to roll over and feel defeated – but Grace knew her future could be brighter. She was determined to make it on her own. Her family needed food and money, two things, she learned, that an irrigation pump could bring her year round. It was just six months ago when Grace purchased a MoneyMaker pump on credit, and you should see her now. Her excitement was palpable. She was eager to tell me she has already doubled her monthly income and expects to quadruple it by the end of the year – and this is only the beginning. She is also investing her money in new businesses, quite obvious ones as I waded through the flocking chickens around her property. But nothing made Grace’s face light up more than when she talked about her children. When we thought of the idea of KickStart – the model, the tools, the approach – we envisioned the millions of people that were struggling to provide for their families. We have given 1.2 million people a kickstart out of poverty—and now that mass of millions is starting to take shape; with faces, names, and stories of fight, dignity, and hope for their children. A generous donation of only $330 gave Grace the opportunity to transform her life and change the course of her children’s’ futures. But our work isn’t done yet. There are millions more still living in poverty and you have the power to unleash their potential. 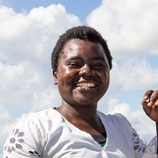 Grace is now earning enough to put her children through school. Her daughter dreams of becoming a doctor and her son will never miss a dose of his life-saving medicine.